Not too many men can rock a pair of retro gas station coveralls. 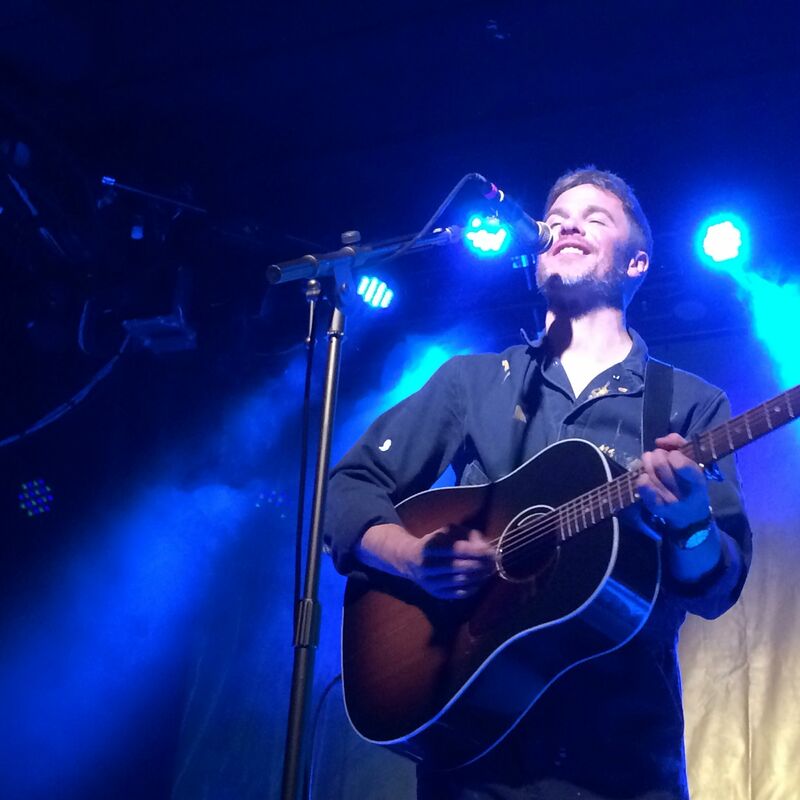 Then again, singer/songwriter Josh Ritter is about as far from your average guy as you can get. Ritter bounded exuberantly on stage at The Sinclair nightclub in Cambridge, MA Monday night, proudly sporting the aforementioned dusty, paint-smeared and splattered coveralls. He looked like he had just leapt from the cover of his newest CD, Sermon on The Rocks, which features a shot of Ritter in the same coveralls, slugging a cold beer against a yellow canvas streaked with paint. Creation, revelation, sweat, grit, heart, and fun fuel the engine behind Ritter's latest project and they also drive the raw energy and unhinged joy of Ritter's live show experience. Ritter sold out the modest-sized Sinclair with little effort, playing to a room of eager hometown fans. Boston gave Ritter a home to hone his indie-Americana sound when the Idaho-native was just another unknown musician with a notebook and plenty of extra guitar strings. Whether on familiar turf or in international waters, Ritter wins audiences with his unfiltered boyish charm and the sheer love for what he does radiating through his playing. Backed by a band of familiar players--Zach Hickman, Sam Kassir, Liam Hurley, Josh Kaufman--Ritter seamlessly moved between the rock-heavy new songs from Sermon and older finger-picking tunes like "Certain Light" and "Change of Time," swapping out his acoustic Gibson for a wickedly-red electric Gretsch to prove that Ritter works best when he can shake up genres and stretch his chops. The high-energy tunes that populate Sermon felt at home in the Sinclair with its standing-only space, making it ideal to move, groove, stomp, and clap along with Ritter and the band. When Ritter sings "I will live in a house of soul" on the bluesy track "Young Moses," you not only believe it, but you feel the invitation to build it along with him. Likewise, the rollicking tune "Cumberland" about a man racing back to love on his country roots begs a riotous call and response chorus urged on by a humming guitar riff that nods to Chuck Berry and the bright sounds of '50s rock. Even the more subdued tunes in the set list like "Idaho," a haunting favorite from The Animal Years and one that Ritter has often performed acapella and "Seeing Me Around," a song from Sermon that veers into the territory of ambient music, held the crowd's attention without diluting the heightened, kinetic energy of the space. It's part of Ritter's gift to trust the audience to follow him and it's part of the pleasure of his performances to willingly take that trip. No Josh Ritter show would be complete without an encore of "Kathleen," the hit off one of his earliest discs, Hello Starling, that helped put Ritter on the map. He has likely literally performed that song thousands of times, but somehow he manages to make it feel as fresh, new, exhilarating, and honest as the first time he played it out. Ritter spins and bounces on his heels as the crowd screams the lyrics back at him. He yells. His face is split wide open in a grin. He beams and suddenly the coveralls make sense. He's just a big kid, making a beautiful mess-terpiece, playing around in a giant sandbox, and for a little while we're lucky enough to get to play too.